The BOINC message boards are now in boinc.berkeley.edu/ rather than boinc.berkeley.edu/dev/. This means, among other things, that when you select a language, it applies to both front page and message boards. Also, the front page now presents the option of participating using Science United. Current volunteers should consider doing this. By making it easier for new projects to get volunteers, SU will encourage the creation of new BOINC projects. Version 7.12 of the BOINC client has been released. Version 7.10.2 of the BOINC client software has been released. It incorporates many bug fixes; a list of changes is here. The 2018 BOINC Workshop will be held July 24-27 at the University of Oxford, England. A paper about Einstein@Home's discovery of a radio-quiet gamma-ray pulsar was published recently in Science Advances. This version fixes screensaver functionality on Mac OS 10.13 High Sierra. Sourcefinder studies algorithms that process 'cubes' of data that contain radio sources, identifying the location of the sources within the cube. It is operated by The International Centre for Radio Astronomy Research (Perth, Australia). Version 7.8.2 of the BOINC client has been released for Windows and Mac OS X. In July 2017 a committee was formed to propose improvements to the BOINC project. Two draft documents are now available for discussion and review: development workflow and governance model. Please give feedback by replying to this thread or posting to the boinc_dev email list. The Crunchers sans Frontieres team is sponsoring the "THOR crunching challenge" from 18 Sept to 5 Nov 2017, to benefit IBM World Community Grid. BOINC needs volunteers to help test new versions of the client software. If you're interested, please visit the Alpha test site and read the instructions. Thanks! The BOINC Workshop 2017 will be held 6-8 Sept in Paris. Everyone with a significant involvement in BOINC is welcome to attend. Thanks to Marius Millea and the Institut d'Astrophysique de Paris for hosting, and to Laurence Field and David Wallom for organizing. XANSONS for COD is a research project aimed at creating an open access database of simulated x-ray and neutron powder diffraction patterns for the nanocrystalline phase of the materials presented in the Crystallography Open Database (COD). Xansons4COD is supported by the Russian Foundation for Basic Research. BOINC Monitor is a very cool Windows gadget for monitoring the progress of lots of tasks. Version 9.70 was released recently. A story in Nature Index discusses volunteer computing. Kathryn Marks has been moderating the BOINC message boards for 10 years now. Her contributions have been stellar, and are much appreciated. Thanks, Kathryn! Version 7.6.33 is now the recommended version for Windows and Mac. TN-Grid is a new project based at the Research Area of Trento of the National Research Council of Italy (CNR) and currently hosted by the University of Trento (UNITN). The first project they are hosting is gene@home, a collaboration with Fondazione Edmund Mach (FEM) & the Department of Information Engineering and Computer Science (DISI) of UNITN. If you run BOINC on multiple Windows computers, check out PSBoinc. It's a PowerShell module for automation of local and remote clients from the shell. The book Community, Competition and Citizen Science by Anne Holohan documents the history of volunteer computing. IBM WCG will give a presentation "Clean Water Through Crowdsourcing and Nanotech" on March 13 at the SXSW event in Austin, TX. Check out How to Start Volunteer Computing in 2016, an article on BOINC and WCG in Inverse, a new science- and tech-centric publication. New AWS BOINC server image available. A new BOINC server image for AWS is now available, making it easy to deploy a BOINC server in the Amazon cloud. The paper "Subdividing Long-Running, Variable-Length Analyses Into Short, Fixed-Length BOINC Workunits" recently appeared in the Journal of Grid Computing. SRBase is a mathematical research project trying to solve Sierpinski / Riesel Bases up to 1030. Check out the BOINC subreddit, which aggregates BOINC news from various sources. The White House is staging a webcast forum on citizen science on Sept. 30. Let's make sure that BOINC and volunteer computing are represented in this event! Please tell the White House about your experience with volunteer computing, and why it's important. An improved version of the BOINC bash script add-on is available. The Einstein@Home project announced the discovery of a new gamma-ray pulsar in data from the Fermi Gamma-ray Space Telescope. Diet BOINC is a no-graphics, lightweight XScreenSaver compatible alternative BOINC screen saver, developed by P.K. Carlisle. It avoids libraries not included with default Linux or Python. The BOINC project has transitioned to a community-based governance model. This model is summarized here and described in detail here. David Anderson gave a keynote talk about BOINC at the 2015 Midwest Instruction and Computing Symposium (MICS) at the Univ. of North Dakota on April 10, 2015. BOINC's localization system has been migrated to Transifex. BOINC Translation System (BTS) is now shut down. The Gerasim@Home project, from Southwest State University (Russia), studies computer engineering. Its current goal: testing and comparison of heuristic methods for CAD systems for designing logic control systems. The Citizen Science Grid is based at the University of North Dakota. It subsumes the DNA@Home and SubsetSum@Home projects, and includes scientific crowdsourcing as well (volunteer brainpower as well as computing power). The Associated Press released a story about IBM World Community Grid's Ebola-related research. The SAT@home project has published two papers about solving cryptanalysis problems for stream ciphers. The Ibercivis Foundation, from Spain, is conducting a crowdfunding campaign to fund the porting of a new biomedical application to their BOINC-based platform. The 10th BOINC Workshop was held recently. Slides from many of the talks are available. Researchers at the Russian Acadamy of Sciences have released CluBORun (Cluster for BOINC Run), a tool for running BOINC on clusters. A paper describing it is here. Paper describes use of BOINC in India. The paper De Novo Assembly in Your Own Lab: Virtual Supercomputer Using Volunteer Computing appeared in the British Journal of Research. ATLAS@Home is a new project from the ATLAS experiment at CERN. Their current app simulates the creation and decay of supersymmetric bosons and fermions. Participants will need to install VirtualBox. The 10th BOINC Workshop will be held at the SZTAKI Institute in Budapest, 29 Sept to 2 Oct 2014. Scikick.org, a proposed non-profit portal for citizen science, has launched a crowdfunding campaign. SETI.Germany invites all BOINC teams to the 5th BOINC Pentathlon, a competition inspired by the Pentathlon in ancient Greece. Teams will compete between May 5 and May 19 at five different BOINC projects to determine the overall winner. The UC Berkeley newspaper featured a story on Power to Give, the HTC/BOINC partnership to promote scientific computing on smartphones. The paper Scientists@Home: What Drives the Quantity and Quality of Online Citizen Science Participation? has been published in the journal PLOS One. HTC is supporting Android-based volunteer computing through a new program called Power to Give. This is described in two YouTube videos: one about how to participate and another about the science being done. BOINC has been working with HTC - one of the world's leading smartphone manufacturers - to bring volunteer computing to Android devices. On February 24th we'll release an exciting result of this partnership - stay tuned! The CONVECTOR project is open and looking for volunteers. The project, based at the Czech Technical University in Prague, studies the optimization of mechanical systems - currently, a system called the "52-bar truss". A new Portuguese-language article discusses BOINC and several of the projects that use it. A new version of BoincTasks interface is available. New features include a "cloud mode" that lets you control BOINC clients from any web browser, and improved support for dynamic client IP addresses. BOINC Client Configuration is a Windows GUI for editing the BOINC client configuration. World Community Grid has summarized the results of a study of volunteer attitudes and motivations. Bloomberg.com recently posted an article on BOINC/Android in their Tech News section. Articles about BOINC on Android are in The UC Berkeley web site, Citizen IBM, and KQED Science. A version of BOINC for Android-based mobile devices was released today, and is available in the Google Play store and the Amazon appstore (for Kindle Fire). Six projects now offer Android applications. SETIspirit is free add-on tool for SETI@home users which provides useful information about the tasks, the SETI@home project status, workunits and credits. It also includes graphical statistic charts and a detailed sky map. The BOINC web site will be down from Friday 22 Feb 3 PM (Pacific time) to Sunday 24 Feb noon. Volpex@UH, a project at University of Houston, seeks alpha testers. Volpex@UH is studying how to use BOINC to do parallel computing across multiple hosts. boinctui, a full-featured curses-based text user interface for BOINC, is now available. It can manage local and remote clients, and allows you to switch between clients with a hot key. IBM World Community Grid celebrates 8 years of computing for humanitarian causes. Congratulations to WCG, which has also contributed greatly to the development of BOINC. The new book Desktop Grid Computing, published by CRC Press, contains several chapters involving BOINC. OProject@Home recently launched and invites volunteers to participate. OProject does research in number theory, quantum computing, and artificial intelligence. Introducing BoincTasks Mobile, an iPad, iPhone and Android compatible visual BOINC interface. The BOINC web site will be offline some of the time between now and Thursday morning PST. This new BAM! feature lets you arrange for actions, such as adding, removing, suspending, or resuming projects, to be performed when given thresholds of queued tasks, credit, and time are reached. A book about BOINC (in German), written by Christian Benjamin Ries, has been published by Springer. IBM World Community Grid recently processed its one billionth job. Congratulations to the project and its volunteers! There was a major power outage on Tuesday evening that affected several buildings here on campus including the entire Space Sciences Laboratory. Power has been restored this morning. The SAT@home project, from the Institute for Systems Analysis of Russian Academy of Sciences, solves hard and practically important problems (discrete functions inversion problems, discrete optimization, bioinformatics, etc) that can be effectively reduced to the Boolean satisfiability problem. The Second London Citizen Cyberscience Summit, involving volunteer computing and other forms of citizen science, will be held 16-18 February 2012 in London. Mersenne@home is a new project, based in Poland, that searches for 'Mersenne primes' - prime numbers of the form 2p-1. The BOINC server (including web site and SVN repository) was offline from 31 Oct to 2 Nov. Things are back up now. Kevin Reed of IBM World Community Grid is profiled in a blog entry on A Smarter Planet. A video on the Clean Energy Project is featured in the Journal of Physical Chemistry Letters. An article entitled Virtual atom smasher in LHC@Home 2.0 appeared recently in International Science Grid This Week (iSGTW). An article in Nature News describes preliminary results from The Clean Energy Project at IBM World Community Grid. Congratulations to Renderfarm.fi, a winner of the 2011 World Summit Award in the e-Science and Technology category. Researchers at IIT in Budapest, Hungary have announced the release of a system for volunteer computing in web browsers that can use BOINC servers for job distribution. Surveill@Home, from the University of Coimbra in Portugal, is a research project that conducts end-to-end fine-grained monitoring of web sites, providing end-user failure and performance statistics. An article on Quake Catcher Network appeared in Stanford University News. BoincTasks, a powerful GUI for managing multiple BOINC clients, now runs on Linux and Mac OS X under Wine. The Open Science Panel at the upcoming Open Knowledge Workshop will feature several talks related to BOINC (Berlin, 30 June). The GPUGRID.net project has recently published three papers, one in Proceedings of the National Academy of Sciences and two in Journal of Chemical Theory and Computation. The sudoku@vtaiwan project, from National Chiao Tung University in Taiwan, addresses the mathematical problem of whether there is a 16-clue Sudoku with a unique solution. The Virtual Prairie project recently published a paper Large scale parameter study of an individual-based model of clonal plant with volunteer computing in the journal Ecological Modeling. Videos of talks at the recent Brasil@home event are available here. Version 1.00 of BoincTasks (a Windows program for managing BOINC clients) has been released after 2 years of hard work and with the help of many volunteers. Brasil@home is a series of events in Brasilia, Rio de Janeiro, and Sao Paolo intended to promote and catalyze citizen science in Brazil. A YouTube video promotes the Intel Progress Thru Processors initiative. A recent press release describes an EDGI demonstration of job submission to a Volunteer Desktop Grid at the EGI User Forum in Vilnius, Lithuania. A paper in The Astrophysical Journal describes the recent discovery of a binary pulsar by Einstein@home. Version 3.1 of BOINC LCS is available. 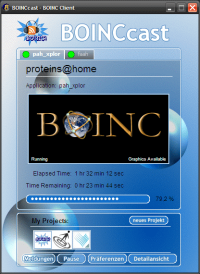 BOINC LCS is a web application, written in PHP, for monitoring a set of BOINC clients. The World Community Grid project has been honored by IBM as one of the top 100 innovations in its 100-year history. A Hackfest will be held March 23-25 in Beijing to develop volunteer computing and citizen science applications. Programmers are welcome! An article in HPCwire discusses Watson's victory on Jeopardy!, and its benefit to IBM World Community Grid. An article about IBM World Community Grid appeared on the Royal Society of Chemistry web site. On January 13th IBM announced that World Community Grid will receive half of the winnings from a man vs. machine contest on the Jeopardy! game show, to air February 14, 15 and 16, 2011. Sony Computer Science Laboratory has released BoincLite, an LGPL library that allows any C application to act as a simple BOINC client - possibly useful in mobile devices and game consoles. Orbit@home, which monitors and studies near-Earth asteroids, is now in production mode with real data, and seeks volunteers to handle its 300K jobs per week. A stolen laptop has been found with the help of BOINC. Welcome to the eOn project from the University of Texas at Austin, which studies the dynamic simulation of physical and chemical processes over a time scale which is much longer than can be reached with traditional molecular dynamics. Check out Computación distribuida BOINC, tu tambien puedes, an article on BOINC in Trucoteca.com, a Spanish website about video games. David Anderson, director of BOINC and SETI@home, is interviewed on www.seti.cl (in Spanish). The Enigma@Home project has decrypted one of 22 previously unbroken German Army messages encrypted with the Enigma machine. Due to a bug in .43/.44, the currently stable BOINC client has been rolled back to 6.10.18. The bug in question only affects volunteers using GPUs that do not have enough GPU RAM to execute their desired project applications. This bug is fixed in 6.10.46 or newer. * The upgrade may delete your login item for BOINC Manager. If this happens, BOINC will not launch automatically when you log in or restart your Mac. Just run the BOINC installer again to fix this. * If you are running CUDA tasks, you must upgrade to version 3.0 of the CUDA drivers, which you can download here. Check out Volunteer Computing Needs You, an article in Computer Power User magazine. An article in iSGTW discusses the use of Grid resources by Einstein@home. The 3rd AlmereGrid Grid Experience workshop, and the EDGeS@Home launch event, will take place March 29/30, 2010 in Almere, The Netherlands. Check out Calcolo Distribuito, an Italian-language web site about volunteer computing and other public-participation science. QuantumFIRE alpha is a test project for QuantumFIRE, which will be dedicated to research into Quantum Foundations and Solid State Physics. The project is based at the Cavendish Laboratory, University of Cambridge. The crunchers@freiburg team has released a German glossary of BOINC terms. An study of cybervolunteer motivation by Viola Krebs has been published in FirstMonday.org, a journal devoted to Internet studies. GPU-based volunteer computing is now available on the Macintosh! Mac owners with NVIDIA GPUs can run GPU-enabled applications from Einstein@home and Collatz Conjecture. You'll need the latest development version of BOINC (6.10.28) and NVIDIA's CUDA driver. An article on volunteer computing appeared today in the Argentine newspaper La Nacion. Version 6.10 of the BOINC client software has been released for general use. Download it here. The Windows versions of 6.6.41 have been recalled due to a version mismatch with recent Microsoft updates. Please use the 6.6.38 version until 6.10 is released. An article in the Wall Street Journal discusses the use of volunteer computing in medical research. An article in PCWorld, 12 Worthy Causes Seek Your Spare PC Cycles, describes BOINC and 12 projects that use it. UNITAR, UNIGE and CERN have agreed to collaborate on a Citizen Cyberscience Centre which, among other things, will promote volunteer computing. The EDGeS project is offering a tutorial on using BOINC for desktop grid computing on 20 Sept 2009 in Barcelona. Intel (in partnership with GridRepublic and BOINC) announces Progress Thru Processors, a Facebook application that makes participating in BOINC simpler and more sociable. Videos of the talks at the recent Asia@home workshop in Taiwan are now online. Listen to a Podcast of an interview with David Anderson on RCE. The Consejeria de Educacion, Spain, is using Jarifa to harness the power of 12,000 PCs. Check out BOINC! How your computer can benefit all of mankind, a story in the online Dish Magazine. Mac users: check out BOINCMenubar 2, an alternative to the BOINC Manager for Mac OS X. Planet BOINC is a new RSS feed that combines many different sources of news about BOINC and volunteer computing. Francois Grey talks about citizen cyber-science at TEDx Warwick. See a video (in Spanish with English subtitles) about Extremadura@home and volunteer computing. Simon Lin of Academia Sinica discusses volunteer computing (and thinking) in Asia on a Podcast on BBC World Service. An article in Cornell's Chronicle Online discusses a new application in Einstein@home that searches for pulsars in binary star systems. 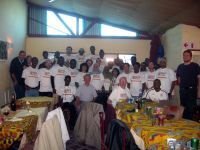 Check out a new French-language web site about volunteer computing. VTU@home, a project from the Vilnius Gediminas Technical University, is now listed on the Choose Projects page. VTU@home serves Lithuanian scientists. It is currently studying the automated testing of complex software systems. Volunteer computing goes East - a story on upcoming events in Taiwan and Beijing - appears in International Science Grid This Week. A new add-on for Windows, BOINCcalculator, shows details (trickles, credit, timesteps, checkpoints) of running CPDN jobs. Cosmology@Home, a project from the University of Illinois whose goal is to search for the model that best describes our Universe, is now listed on the Choose Projects page. We have rolled back to 6.4.5 for our latest stable version until 6.4.7 can be built. Something happened to 6.4.6 on our mirrors. A workshop on volunteer computing will take place 16-17 April 2009 at the Academia Sinica in Taipei, Taiwan, in conjunction with the International Symposium on Grid Computing. Extremadura@home is a new kind of account manager in which the choice of projects is a group decision. It's targeted at Spanish computer owners but is open to everyone. Dotsch/UX is an ISO-format Linux distribution, based on Ubuntu Linux, with the 6.2.15 BOINC client pre-installed. It lets you easily install and boot from a USB stick, hard disk and from diskless clients, and it also has some interfaces to set up the diskless server and the clients automatically. Download info is here. A paper about Quake-Catcher Network appeared in Seismological Research Letters, Jan/Feb 2009. A press release from NVIDIA announcing BOINC's GPU support is available in English, Spanish, and Catalan. Version 6.4 of the BOINC client software has been released. This is the recommended version for Windows and Linux. Upgrade now. AQUA@home is now open to volunteers. AQUA (Adiabatic QUantum Algorithms) is a research project, based at D-Wave Systems, Inc., whose goal is to predict the performance of superconducting adiabatic quantum computers on a variety of hard problems arising in fields ranging from materials science to machine learning. IBM World Community Grid and Harvard launch an application to study a new type of photovoltaic solar cells. Check out BOINC.Italy, a new Italian BOINC portal. Rechenkraft.net is petitioning the German government to use non-security sensitive institutional computers to assist scientific research. See a video celebrating the fourth anniversary of IBM World Community Grid. Jarifa, a system for organizational grid computing using BOINC, has a new name, logo, and domain. Read Reaching for the Exa-scale with volunteer computing in International Science Grid This Week. An article on the recent BOINC workshop in Grenoble appeared in International Science Grid This Week. See an open letter to the Electronic Frontier Foundation. Read an article about Quake Catcher Network in Economist.com. The talks and tutorials from the upcoming BOINC Workshop (Sept 10-12) will be broadcast live on the Web. BOINC is featured on the University of Delaware news site. LinkedIn users: join a BOINC Users group. BOINC 6.2 is now the recommended version for all platforms. Upgrade now. The Quake Catcher Network detected today's magnitude 5.4 earthquake in Los Angeles within 7 seconds. The First East Coast BOINC Meeting will take place August 29 2008 at the University of Delaware. GPU computing has arrived to BOINC! The GPUGRID.net project from the Barcelona Biomedical Research Park (PRBB) uses CUDA-capable NVIDIA chips to create an infrastructure for biomolecular simulations. (Currently available for Linux64; other platforms to follow soon. To participate, follow the instructions on the web site). BOINC-logo merchandise (T-shirts, mouse pads) is now available. BOINCstats and BAM! are now available in Brazilian Portuguese and Turkish. The Orbit@home project from the Planetary Science Institute is open for public beta test. Orbit@home focuses on celestial mechanics, Their first scientific application, SurveySimulator, simulates the performance of astronomical surveys searching for Near Earth Objects (NEOs) such as asteroids and comets. BOINC volunteer Werner Klein is interviewed in Sternengucker.org (German). Version 3.0 of Boinc LCS (a free PHP script for monitoring remote BOINC clients) has been released. The BOINC user documentation has been moved from Trac to Mediawiki, which provides better navigation and editing interfaces. Please help us fix the remaining broken links. The BOINC client software is now available for Fedora 7 and higher from official repositories. To install it, just type yum install boinc-client boinc-manager as root. Thanks to Milos Jakubicek, with help from Eric Myers and Debarshi Ray. Scientific progress goes BOINC! Read about the Scientific publications of BOINC-based projects. Where is BOINC headed? Marcin Cieslak's vision: BOINC on JXTA. Bulgarian BOINC users: find forums and information in your language at BOINC Bulgaria. Proteins@Home has resumed operations. Check out their paper on computational protein design in the Journal of Computational Chemistry. A new article from the Planetary Society: From SETI@home to Hominid Fossils: Citizen Cyberscience Reshapes Research Landscape. A new competition for BOINC teams, Formula BOINC, is based on their position with projects (as in Formula 1 racing) rather than overall credit. This rewards teams that are diversified across many projects. The TSP (Traveling Salesman Problem) project is using BOINC to find the shortest path between the capitals of the lower 48 states. Leiden Classical allows students (and the public) to submit particle-system simulation jobs, and is thus a resource for both education and research. The job-submission system used by Leiden Classical is now included in the BOINC source code distribution. BOINC needs more volunteer programmers! If you're proficient in PHP and MySQL, C++ and WxWidgets, or C++ system programming, please read about how you can help. The BOINC-based BBC Climate Change Experiment has won the prestigious Prix Europa award in the Internet category. BOINC user John Koulouris has written The Big BOINC! Projects and Chronology Page, a brief history of BOINC. Congratulations to the UK BOINC Team, which today became the first UK-specific team to pass the 100 million combined credits mark. An article in Nature, The shape of protein structures to come, discusses the goals and progress of the Rosetta@home project from the University of Washington. 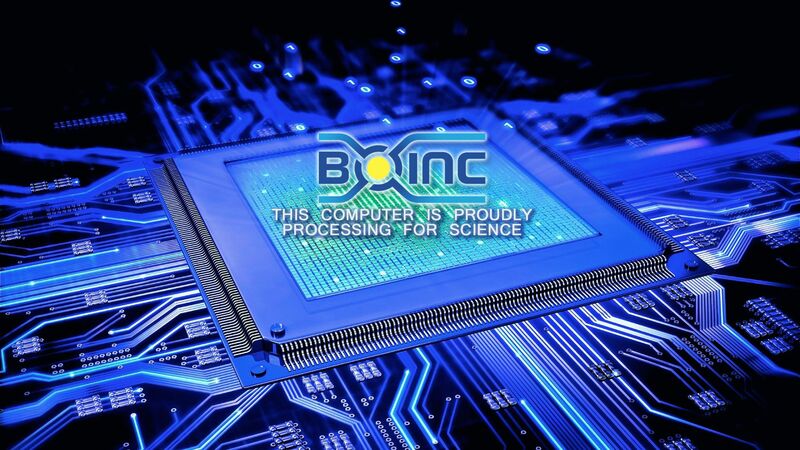 The National Science Foundation has awarded a three-year grant, NSF award #OCI-0721124, to the BOINC project. This will support our development efforts through August 2010. Check out the SHA-1 Collision Search Graz project, which is based at the Graz University of Technology and does research in cryptography. Team founders: you can now make your team BOINC-wide, meaning that it will be created on all current and future BOINC projects. The new BOINC logo is now available in a variety of formats and resolutions. World Community Grid has announced that it is migrating fully to BOINC. Welcome to all WCG participants! A newly-launched project, Eternity2.net, offers a chance to compute for a share of a US$2,000,000 prize. If you use the Yahoo! Widget Engine, check out version 1.1 of the BOINC Server Status widget. Welcome to a new web site with cross-project BOINC statistics: Team Starfire World BOINC Stats 'N Stones. Read Volunteer computing: Grid or not Grid? on International Science Grid This Week. Amir Alexander of The Planetary Society talks about SETI, distributed computing, and space exploration in an interview by Mike of BOINC UK. There are reports that version 5.10.8 of the BOINC client software causes a problem on Windows XP Pro in which the desktop becomes empty. If you see this, please uninstall 5.10.8 and install version 5.8.16. Sony Playstation 3 owners: researchers at the Barcelona Biomedical Research Park have launched PS3GRID, a BOINC-based project whose application (molecular dynamics simulations) runs on the PS3's Cell processor, on Linux. A Flash guide to using BOINC with IBM World Community Grid is available in Czech and English. The 3rd Pan-Galactic BOINC Workshop will be held 5-6 September 2007 in Geneva, Switzerland. The BOINC Virtual Server - a VMWare virtual machine preconfigured with BOINC and all prerequisite software - is now available. This greatly simplifies the task of creating a BOINC projects. Thanks to Christian Beer for creating this. An excellent article on BOINC and the projects using it appeared today in the Catalan newspaper AVUI. It is available in PDF (pages one and two) and also as a web page. Thanks to Dr. Jordi Portell i de Mora for telling us about it. GridRepublic announces a significant upgrade to their web site, including improved registration workflow and better integration with IBM World Community Grid (including WCG sub-project registration). BOINCstats and BAM! are now available in the Czech language (http://cz.boincstats.com). Thanks to Zelvuska for the translation. Desktopgrid.hu has been created by the Computer and Automation Research Institute (SZATAKI) of the Hungarian Academy of Sciences (MTA). It provides information (and software downloads) for using BOINC for desktop Grid computing. BOINC is now using Trac, an integrated software project management system. In particular: 1) the BOINC source code repository now uses Subversion; 2) the BOINC bug database has been moved to Trac; 3) documentation will be moved to a Wiki. See the BOINC/Trac page. The BBC documentary 'Meltdown', which highlights Climateprediction.net, has been nominated for a British Academy of Film and Television Arts academy award. Dr. Anderson gave the keynote talk, Volunteer Computing: Planting the Flag, at the PCGrid 2007 workshop, held at the IPDPS conference in Long Beach on March 30. If you can read Czech, czech out some excellent Flash-based BOINC tutorials. Africa@home (with support from the Geneva International Academic Network) is sponsoring an intensive one-week workshop on volunteer computing for qualified African students, to be held at the African Institute for Mathematical Sciences in Muizenberg, South Africa, 16-22 July 2007. Don't use them for postage, but check out the BOINC stamps created by Myster65 and Rebirther. The article Idle Cycles - building distributed applications with BOINC Seil appears in the Oct 2006 issue of Linux Magazine. In it, author Marc Seil provides a detailed description of how to set up a BOINC project. Marc Seil gave a talk on setting up a BOINC server at the recent LinuxDays conference in Luxembourg. His slides are here. GridRepublic has been selected as a finalist for the Web Awards at the 2007 SXSW Interactive Festival. Please click here to cast your vote for them at the SXSW website. The documentation on Creating BOINC Projects is now available as one big PDF file. Check out a TV news segment and a web site about the results of the recently-completed BBC Climate Change Experiment. On January 21 BBC aired a documentary on the results of this project; an excerpt is here. Linux users: check out KBoincMgr, a replacement for the BOINC Manager. KBoincMgr can manage multiple BOINC clients, and has other features too numerous to mention. The ABC@home project, based at Leiden University in Holland, is now open. ABC@home is studying the ABC conjecture, a major open problem in mathematics. MySpace users: check out the BOINC on MySpace group. A paper about BOINC client scheduling will appear in the Workshop on Large-Scale, Volatile Desktop Grids held in conjunction with the IEEE International Parallel & Distributed Processing Symposium (IPDPS), March 30, 2007, Long Beach. The Proteins@Home project is now open. Proteins@Home is a large-scale protein structure prediction project, and is based at the École Polytechnique in Paris. Olaf Bornack of Team BOINC@Halle/Saale has supplied stencils for creating skins for the new BOINC GUI. These have been used to make skins with BOINCcast, BOINC@Halle/Saale, and BOINCmas! themes. It hasn't been released yet, but already several skins are available for BOINC Manager version 5.8 (currently under test as version 5.7.x). Check out Crunching Family Skin Downloads. A recent article in the Bulletin of the Howard Hughes Medical Institute, A Cast of Thousands, discusses the [url=http://boinc.bakerlab.org/rosetta/]Rosetta@home project and its army of dedicated volunteers. Jean-Michel Penasse of L'Alliance Francophone has create a web site, www.myboinc.com, showing the User of the Day of all BOINC projects going back to October 8 2006. Check it out! Docking@home participants: the project is unreachable because of a campus-wide network connection failure at Univ. of Texas - El Paso. Please check back periodically. BOINCstats is now available in Spanish. Thanks to Miquel Pericas for the translation. BOINCstats in Spanish can be visited at http://es.boincstats.com. Check out new add-on software: the SETI@home Toolbar for Firefox and IE on Windows (SETI@home-specific), and Boinctray, a system tray application for Linux. We are preparing to release client software with a new GUI that is simpler, smaller, and more graphical than the current BOINC manager. Projects can supply their own graphics (icons, application-specific slideshows) for use in this GUI; see instructions for how to do this. In addition, the GUI itself is skinnable; a skin consists of an XML file and a collection of images. Versions of BOINC (and some applications) are now available for Solaris (x86, i686, SPARC), Linux (Alpha, SPARC), FreeBSD (x86, Alpha) and HPUX (including the BOINC Manager) from www.lb.shuttle.de. Eric Korpela and David Anderson were interviewed today by Mike O'Connell of BOINC UK. Many topics were covered, including the question of credit and optimized clients. Download a recording of the conversation (MP3, 13.5 MB) from BOINC UK or a mirror at Berkeley. UW-Madison CAE, the first BOINC user to top the 1 TERAFLOPS barrier, now has surpassed 2 TERAFLOPS. Congratulations! 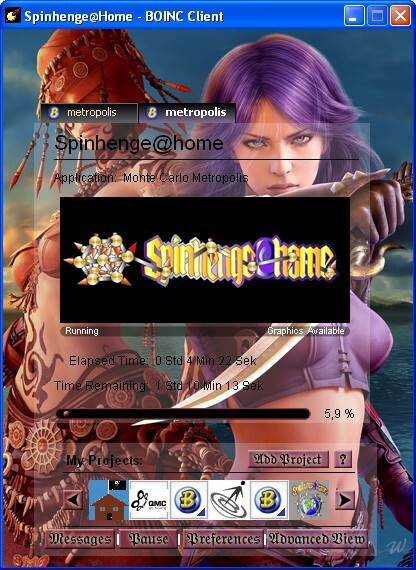 The Spinhenge project has moved into public beta test, and is accepting new participant accounts. GridRepublic, a BOINC account manager, recently moved into beta test. It was written up by CNET. A BBC Radio program on 'Citizen Science' - including a segment on volunteer computing and BOINC - will air tomorrow, 16 Aug 2006, 9 PM British Time. It will also be available online. Participants with preferences for different venues (home, school, work) can now view these side-by-side in a multi-column format. Also, preference values are now checked for validity. Thanks to Christian Beer for the PHP programming behind these improvements. A recent update of McAfee security software on Windows causes BOINC 5.4.9 to not work (details). We have released a new version, 5.4.11, that fixes the problem and works with the latest McAfee software. The 2nd Pan-Galactic BOINC Workshop will be held 20-21 September at the University of Geneva, Switzerland. Anyone actively involved with BOINC is encouraged to attend. Chess960@home is open for testers. This project studies a game that is like classical chess except that the initial configuration of pieces is chosen randomly from among 960 possibilities. Welcome to three new BOINC-based projects. Two are mathematical: Riesel Sieve looks for prime numbers of the form k2n-1, and Rectilinear Crossing Number studies a problem in computational geometry. The third, Spinhenge@home, studies molecular magnets and controlled nanoscale magnetism, which may have applications in medicine and biotechnology. The BOINC survey is now available in Japanese. If you'd like to translate it to another language, please contact us. Want to deploy BOINC quickly and easily on a Windows network? Read The Lazy Slug's Guide to easy deployment and maintenance of BOINC on your network. A paper about BOINC's API and runtime system will appear in the SC06 conference. A new Secure BOINC Client for the Macintosh is available for testing. This version limits BOINC applications' access to your system and data, thus protecting your computer from accidental or malicious damage or data theft. We have added preliminary support for legacy applications that do not use the BOINC API (e.g. because their source code is not available). This feature will work with the next version (5.6) of the BOINC client software. Windows users: if BOINC applications are repeatedly crashing on your computer, it's possibly that you need to upgrade to the latest version of DirectX. Version 5.4 of the BOINC client software has been released. This version lets you use account managers - special web sites that let you browse BOINC projects, attach/detach, change resource share and settings, all with point-and-click simplicity. Account managers are also great if you have several computers - you make changes on the web site, and they take effect on all of your computers. A couple of excellent account managers are nearly ready for use; stay tuned for details. The latest German BOINCcast discusses ClimatePrediction.net; earlier BOINCcasts cover SIMAP, LHC@home, and uFluids. According to various statistics sites, over one million computers have now contributed processing power to BOINC projects. We're currently achieving a sustained processing rate of over 400 TeraFLOPS - the world's most powerful supercomputer by a wide margin. Congratulations and thanks to everyone! We have developed an example application, together with project files and Makefiles for Windows, Mac, and Linux. The application demonstrates how to do checkpoint/restart and graphics. Projects can use this as a framework for building their own applications. Thanks to the efforts of volunteers, BOINC is now officially part of the Debian Linux distribution. Packages for the BOINC core client and Manager are available for 13 different platforms (alpha, amd64, arm, hppa, i386, ia64, kfreebsd-i386, m68k, mips, mipsel, powerpc, s390 and sparc). BOINCstats.com is one of several excellent web sites showing BOINC statistics. It's available in a number of languages, now including Chinese. Tony/Knightrider/Chuggybus has created BOINC coinage. See the large and small versions. The Latin text means 'Berkeley open and shared resources'. A significant step has been made towards integrating BOINC and Grid software: beginning with Condor version 6.7.17, Condor can be configured to run BOINC when it has no other work to perform. This capability is described in the Condor manual. View a video clip about the BBC Climate Change Experiment. BOINC and Climateprediction.net have joined forces with the BBC to launch a new experiment -- a full simulation of climate change from 1920 to 2080. The experiment is described on a BBC television documentary Meltdown (BBC-4, February 20th, for UK BOINCers). Simplified client software is available at bbc.co.uk/climatechange. Experienced BOINCers can attach to http://bbc.cpdn.org (check out the new graphics!). Be warned that a 160-year climate simulation is a long workunit even by Climateprediction.net's extravagant standards. But if you have a fast machine and are prepared to give us first call on your CPU, just for the next couple of months, then you could see your results in a second BBC television programme scheduled for May. A story about SETI@home's transition to BOINC appears in the Nature web site. A new paper, The Computational and Storage Potential of Volunteer Computing, explores the limits of BOINC-based projects. BOINC has a job opening for an experienced programmer (C++/Python/PHP/SQL/HTML). For more information go to http://jobs.berkeley.edu/. The job is number 003496, and is listed under Information Technology. We have created a new email list, boinc_announce@ssl.berkeley.edu, for announcements of new versions of BOINC client software. Aggregate credit data (user and host credit data summed over all BOINC projects) is now available in XML format. This data can be used for applications (like the 'Featured participant' above) that reflect overall contribution to BOINC project. IBM's World Community Grid has launched a BOINC-based project (currenly Linux only). Rosetta@home, a BOINC-based project at the University of Washington, has launched and is seeking participants. Its goal is "..
Rosetta@home, a BOINC-based project at the University of Washington, has launched and is seeking participants. Its goal is "... to develop methods that accurately predict and design protein structures and complexes, an endeavor that may ultimately help researchers develop cures for human diseases." High-Performance Task Distribution for Volunteer Computing, a paper about BOINC server performance, will appear in the e-Science 2005 conference in December. BOINC is transitioning to use libcurl for HTTP operations. This will allow BOINC to use HTTPS (secure HTTP) for scheduler requests and file transfers. Non-open-source code (RSAEuro and GLUT) has been removed from BOINC. OpenSSL's crypto library is used for encryption. A group of students from Cornell have written Distributing Science, a very nice article about BOINC and some of the projects using it. A paper by Jakob Pedersen and Christian Søttrup discusses the interoperation of the Grid and BOINC. The First Pangalactic BOINC Workshop was held at CERN, bringing together people from ClimatePrediction.net, Einstein@home, CERN, and BOINC. We have added new API calls that allow applications to do their own CPU benchmarking, or directly report their floating-point operation count. This will give more accurate credit numbers for applications that are optimized for specific architectures or that use non-CPU computing resources such as GPUs. We've added two mechanisms that give better estimates of result completion time (and thus better scheduling and fewer missed deadlines): 1) we track the 'CPU efficiency': the average fraction of CPU time that BOINC apps receive while they're running (this can be less than one on systems that run compute-intensive tasks other than BOINC); 2) we dynamically maintain a per-project upper bound on the ratio of actual CPU time to predicted CPU time. We've improved and simplified the CPU scheduling and work-fetch policies, using a detailed simulation of BOINC's weighted round-robin scheduling. When the simulator predicts that a deadline will be missed, the client switches to earliest-deadline-first scheduling. When the simulator predicts that fetching additional work will cause a deadline to be missed, it suspends work fetch. Account management system are web sites that let participants sign up for multiple projects with just a few clicks (and no account keys). The BOINC manager (development version) now lets you select, change, or get updated account info from an account manager. BOINC now works in Windows 'service' mode on computers with dialup connections and the 'confirm before connect' preference set. The connection confirmation and setup process has been moved to the BOINC manager, which (unlike a service) is able to do GUI activities. Climateprediction.net is featured in an article in the journal of the Institute of Electrical Engineers. BOINC and BOINC-based projects are discussed in the article 'Grassroots Computing' in the May 6 2005 issue of Science magazine. LHC@home is a BOINC-based project being used to simulate the orbits of particles in CERN's Large Hadron Collider (LHC). Read about it in the CERN Bulletin. Many BOINC applications have interactive graphics (e.g. you can zoom in/out using the mouse). For apps that use the latest BOINC API, you can interact even when in screensaver mode - just hold down the control key. We finally have an installer and GUI for Mac OS X! It is available as a development version, and will become the standard version soon. Volunteers have ported SETI@home and BOINC to a variety of platforms, including Solaris/x86-64, Linux/x86-64, Linux/PPC, HP-UX, and FreeBSD. BOINC source code is now distributed under the Lesser GNU Public License (LPGL). BOINC-based projects projects now have 80,721 participants in 188 countries. Based on current credit statistics, together they supply 106 TeraFLOPS of computing power - far more than any conventional supercomputer. A technical paper about BOINC is here. This paper appeared in the 5th IEEE/ACM International Workshop on Grid Computing, November 8, 2004, Pittsburgh, USA. We have developed a GUI for the core client. It's similar to the old Windows GUI but is implemented using wxWidgets so it runs on all platforms. It offers new features such as the ability to suspend/resume projects and results, and project-specific web links. It uses a socket-based GUI RPC mechanism, which makes it possible to develop other GUIs, including ones that control many hosts. XML Schemas for the statistics data exported by BOINC projects is here, and graphical representations are here. We have created an email list, boinc_opt@ssl.berkeley.edu, for people interested in porting and optimizing BOINC applications. Sign up here. We are working on a new type of work distribution, called Locality scheduling, that sends work to hosts that already have the needed files. The statistics export mechanism has been redesigned to give projects more control over what they export; e.g. they can shift the burden of sorting to statistics web sites. Source code is now available directly via CVS. Improved Unix signal handling. Support app versions, workunits and results with lots of files (changed XML fields from 4KB to 64KB). Added homogeneous redundancy mechanism. Recent fixes and features: trickle messages for long-running work units; benchmarking for hyperthreaded CPUs; don't propagate preferences from hosts to projects; check for file existence before running apps; SOCKS proxy support; separate suspend/resume for network activity; fix race conditions in server; add file compression code. See checkin_notes for details. We've released BOINC version 2.0. All BOINC components must be upgraded to major version 2. We've upgraded the Astropulse server to 2.01 and released BOINC core client 2.01. This was due to an architecture and protocol change in specifying resource estimates and limits. BOINC server tools are now Python-based. A database back-end API allows quick development of data-manipulation utilities. We are preparing a BOINC-based version of SETI@home. See a preview of the graphics. Non-English language.ini files are available. Preferences include time-of-day restrictions. Core client and applications communicate via shared memory and signals rather than files, reducing disk traffic. New account parameters and preferences: URL, limit number of processors, frequency of writes to disk, whether to show your computers on the web. A screenshot of the BOINC client running AstroPulse, our first test application. We have started a beta test of BOINC using the Astropulse application. Many bugs have been found and fixed.